The most awaited richly-rich 11th edition of Indian Premier Leagues is all set to make a kickstart from this Saturday. Apart from watching our favourite cricketer smashing their opponents on the field, the grand opening ceremony of the IPL is another glitter to the event. The grand opening ceremony of IPL is scheduled to beat the Wankhede stadium, Mumbai. Every team's members are gearing up for off and on-field chemistry. While leg-spinner Yuzvendra Chahal shared a video of him shaking legs with RCB leader Virat Kohli and Brendon McCullum as their warm-up session. Chahal took to Twitter to share a short video of Royal Challenge Bangalore's captain Virat, new entry Brendon McCullum and himself shaking legs and showcasing an impeccable dance moves. 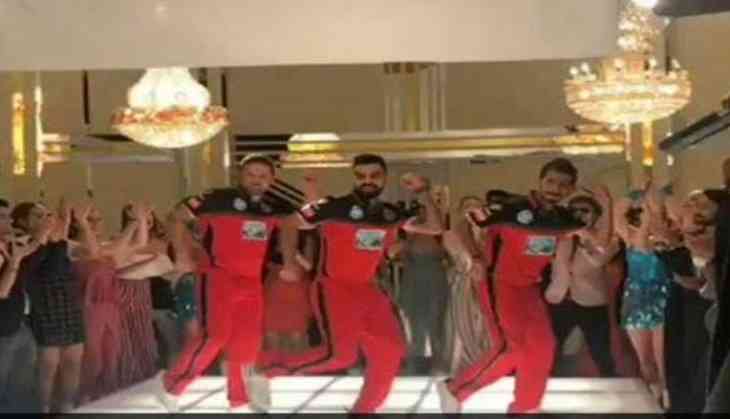 In the 12-seconds video, the three cricketers are seen shaking legs and stealing all the limelight with their 'warm-up moves'. RCB is one of the most commanding teams in the league but unfortunately never managed to lift the title. RCB will commence their campaign for IPL's 11 edition on April 8 against Kolkata Knight Riders. The RCB's batting unit for the 11th season is New Zealand's batsman McCullum, South Africa wicketkeeper batsmen Quinton De Kock and Indian wicketkeeper Parthiv Patel. The spin department of RCB will be led by Chahal, Washington Sundar, M Ashwin and Pawan Negi. RCB Squad: Virat Kohli (captain), AB de Villiers, Brendon McCullum, Quinton de Kock, Parthiv Patel, Sarfaraz Khan, Mandeep Singh, Manan Vohra, Pavan Deshpande, Corey Anderson, Chris Woakes, Colin de Grandhomme, Moeen Ali, Anirudha Joshi, Pawan Negi, Umesh Yadav, Tim Southee, Navdeep Saini, Aniket Choudhary, Mohammed Siraj, Kulwant Khejroliya, Yuzvendra Chahal, Washington Sundar, Murugan Ashwin.